Designer Christmas Stockings with Glitter Print on Sheer Organza, Gold Velvet French Cuff with gold trim piping and gold tassel on the cuff. 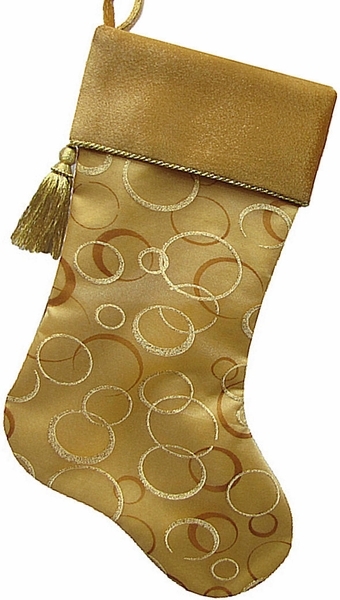 , The classic style stocking has a soft feel and rich, luxurious touch, and is fully lined. The Christmas stocking measures 18.5 inches diagonally from toe to the loop hanger, and it's 7.5 inches wide at the top. Materials and Design: Glitter Print on Sheer Organza, Gold Velvet French Cuff with gold trim piping and gold tassel on the cuff. Fully lined inside in satin. 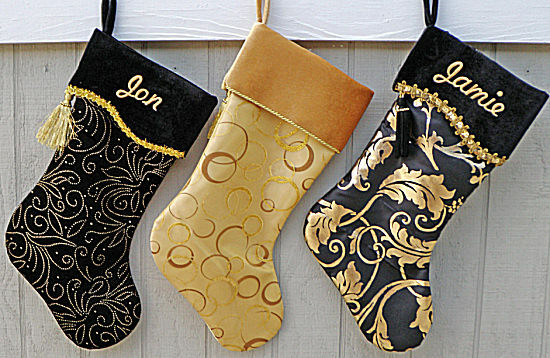 We also have other similar matching holiday stockings in the same design so if you are buying for a group, you have the option of getting one color scheme for some and other color scheme for others in the group. 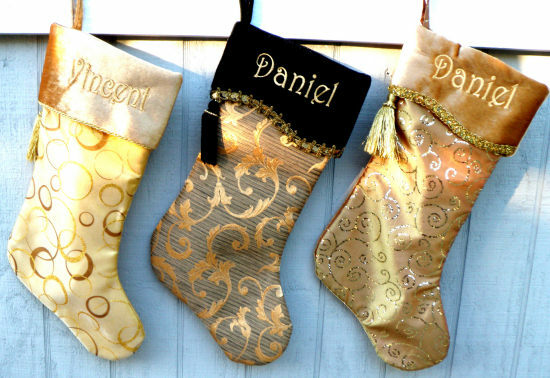 Names can be personalized on the velvet cuff of this rich Christmas stocking with GOLD metallic embroidery thread to compliment the luxurious feel of the velvet material.